According to a new survey from Vancouver-based Insights West, a poll of 1,013 Canadian adults taken online says 66 per cent of respondents would be in favour of ‘distracted walking’ laws for people walking on roadways (i.e. crossing the street). Among respondents aged 55 years and over, support for such a law jumps to 80 per cent. Blame those darn skinny-jeans-wearing hipsters, right? 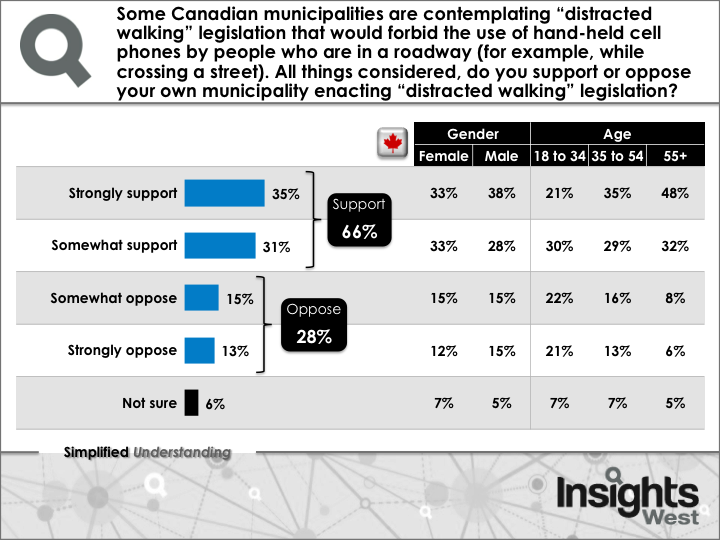 The Insights West poll also found 93 per cent of Canadians supported distracted driving legislation in every province and territory (except Nunavut), but only 51 per cent found laws were effective in preventing people from the dangerous habit. This summer, Vancouver City Councillor Geoff Meggs wanted to ban people from texting while crossing the street, to follow a similar proposal made in Toronto. What do you think? Stop people from texting and walking when crossing the street with legislation, or let people pay the price when they get t-boned while posting to Instagram?